On May 19th, 2017, the first true sequel to the Alien film franchise in two decades will hit theaters in the United States. Alien: Covenant will introduce fear into a brand new audience when it releases this Summer. 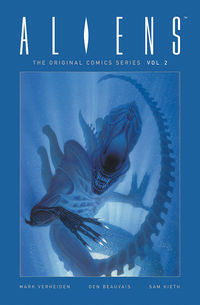 In the meantime, your friends at TFAW recommend that you check out our extensive catalog of Aliens comics and graphic novels from Dark Horse. Looking to make your home or office a shrine to Xenomorphs? Then you'll love our collection of Aliens merchandise, including action figures, Funko POPs, and more! On May 19th, 2017, the first true sequel to the Alien film franchise in two decades will hit theaters in the United States. Alien: Covenant will introduce fear into a brand new audience when it releases this Summer. In the meantime, your friends at TFAW recommend that you check out our extensive catalog of Aliens comics and graphic novels from Dark Horse. Legal Notice: Entire contents trademarked (® or TM) and copyrighted (©) 1986-2019 by Things From Another World, Inc. and respective copyright and trademark holders. All rights reserved. Page rendered at 2019-04-23 11:40:30 in 0.379 seconds.